Two very different fabric ranges have been added to the website. There are 24 new Thimbleberries fabrics from Lynette Jensen. The Lodge & Lakeside fabrics are in country shades of Blues, Greens, Reds and Browns, with a variety of designs from but many with a floral theme. The Arizona range of Batiks meanwhile feature a fossil leaf and dotted circle motif to bring variety to the warmer batik palette. We have started our February Winter Web sale with some great bargains on our fabrics. There is now a range of 6o Tonga Batik fabrics down from £9/m to £8/m. There is a large selection of some excellent Philip Jacobs fabrics which are now down to £5.60/m. This section also contains our Kaffe Fassett bargain fabrics. 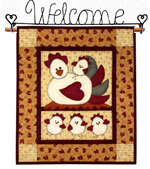 For something completely different try our Cherished Memory range from Quilt Gate down from £10.40 to £8.80/m. Also for great web bargain fabrics then check out our Bargain fabrics section. There are 150 new fabrics added to our existing range all at the bargain price of £6/m. For further details on items in the sale then click here.